Justin Fraser, BSc, is a veterinary student at University of Tennessee, where he earned his bachelor’s degree in animal science. He plans to pursue a career in veterinary cardiology. Shelly J. Olin, DVM, DACVIM (SAIM), is an assistant professor at University of Tennessee, where she completed an internal medicine residency. Dr. Olin earned her DVM from and completed a rotating internship in small animal medicine and surgery at University of Georgia. She has also worked as an emergency veterinarian in Atlanta, Georgia. Her clinical interests are endocrinology, interventional procedures, and teaching. A 7-year-old spayed female domestic shorthair cat is presented for routine dental cleaning and extraction of the left maxillary premolar. The patient is bright and alert with a normal energy level. Physical examination is unremarkable, with the exception of grade 3 periodontal disease. Preoperative CBC, serum chemistry profile, total thyroxine, urinalysis, and blood pressure are normal. The cat is premedicated with butorphanol (0.2 mg/kg IM) and tiletamine–zolazepam (3 mg/kg IM) before sedation is induced with propofol (6 mg/kg IV to effect). The patient is intubated, and anesthesia is maintained with isoflurane (1.5%) in 100% oxygen. Intravenous fluid rate during anesthesia is 10 mL/kg/hr. Monitoring includes pulse oximetry reading (peripheral capillary oxygen saturation [SpO2]), systolic blood pressure, and electrocardiography. SpO2 is maintained above 95%, blood pressure ranges from 100 to 110 mm Hg, and heart rate is stable between 160 and 170 bpm with no arrhythmias. With the patient positioned in lateral recumbency, dental radiographs are obtained. The patient is stable under anesthesia, and the team prepares to begin the procedure. Maintain good visualization with a spring-loaded mouth gag, which may be most convenient, for maximal opening of the jaw. Maintain good visualization with a small mouth gag crafted from a hypodermic needle cap cut to 20 mm in length and use your fingers to retract the lips during the procedure. You elect to use a spring-loaded mouth gag for maximal opening of the jaw (Figure 1). The procedure takes approximately an hour, and no complications are encountered. Anesthesia is uneventful, and the patient is placed in a cage for recovery. Recovery is slow, and the cat is observed to be dull, weak, and circling in the cage. A thorough physical examination is performed. Physical examination findings include apparent blindness and absent menace response in both eyes (OU). Pupils are mydriatic but equally sized. Direct and indirect pupillary light reflexes are normal OU. Dazzle reflex is positive OU, and palpebral reflex is normal OU. Fundic examination by indirect ophthalmoscopy is normal OU. The cat appears ataxic with conscious proprioceptive deficits on the right and circling to the left. In addition, cadaver dissection has revealed that full jaw extension causes stretching of the vasculature.2,4 Blood flow through the maxillary artery is compromised due to compressive and stretching forces. Spring-loaded mouth gags, especially when fully opened, may be particularly dangerous because the forces holding the mouth open are continuous and strong. Blood supply to critical brain and eye structures are at risk for compromise when the jaw is fully opened for a period of time, which increases the risk for ischemia. The BAER test is a minimally invasive, electrodiagnostic test used to detect electrical activity in the cochlea and auditory pathways within the brain.8 The BAER test has also been found to be useful in detecting ischemic processes within the brain.9 An abnormal BAER would suggest that maximal opening of the mouth has impaired blood flow to the auditory parts of the brain. The patient’s recovery is slow. After 9 days, the patient is still blind OU and weak on the right side but no longer circling. At follow-up examination 4 months later, vision is normal and neurologic signs have resolved. Spring-loaded mouth gags can cause altered blood flow to the maxillary artery, which provides the primary blood supply to the brain and retina of cats. Therefore, mouth gags—especially spring-loaded mouth gags—that fully extend the mouth are not recommended in cats because of the risk for ischemia. Blindness and neurologic signs secondary to ischemia can be temporary or permanent. It is recommended to use caution in cats when opening the mouth widely, and the duration the mouth is open should be minimized as much as possible. You elect to use a small mouth gag crafted from a hypodermic needle cap cut to 20 mm in length (Figure 2), and you use your fingers to retract the lips during the procedure. The procedure takes approximately one hour and is completed without complication. Anesthesia is uneventful, and the cat is placed in a cage for recovery. The patient is slow to recover but appears normal. It has been hypothesized that using something similar to a spring-loaded gag (eg, the cap of a hypodermic needle) could provide a suitable alternative and not fully opening the mouth could decrease the compromise of the maxillary artery.3 In one study evaluating the effects of a 42-mm plastic mouth gag and a spring-loaded 7.6-mm mouth gag on magnetic resonance angiography in 6 healthy adult cats, 4 cats (66%) had altered blood flow with their mouths maximally opened with the spring-loaded gag3; however, one cat also had reduced blood flow with submaximal mouth opening using the 42-mm plastic gag, about the size of a standard hypodermic needle cap.3 Even though the spring-loaded mouth gag was smaller, it resulted in a disproportionate amount of force exerted on the tissues.3 The results of this study are important and indicate that even submaximal openings of the mouth can cause alterations in maxillary arterial blood flow in some cats. There have been no studies evaluating the risk for postoperative ischemic complications in cats from submaximal openings of the mouth. It is essential to recognize that changes to maxillary arterial blood flow can occur very quickly after mouth gag application. In experimental studies, alterations in blood flow occurred within 5 minutes.3,5 In one cat, reduced retinal blood flow in the eye ipsilateral to the mouth gag was documented on ERG as early as 3 minutes after placing a spring-loaded mouth gag.3 The changes in retinal blood flow were reversible, and the ERG waves returned to normal physiologic levels within 30 seconds of removing the mouth gag.3 In a retrospective case series, the duration of anesthesia was not associated with the severity of clinical signs.2 In affected cats, the duration of anesthesia ranged from 20 minutes to 5.5 hours, and all affected cats had the mouth gags in full extension.2 Another consideration is that as the mouth is opened more widely, increased tension on the lips makes them more difficult to retract,7 which can impair visualization and complicate the procedure. With smaller mouth gags, the lips have more movement and can be easily moved out of the way. Ideally, a mouth gag should not be used at all and the lips should be retracted out of the working visual field as needed. The cat does well postoperatively and makes a full recovery. 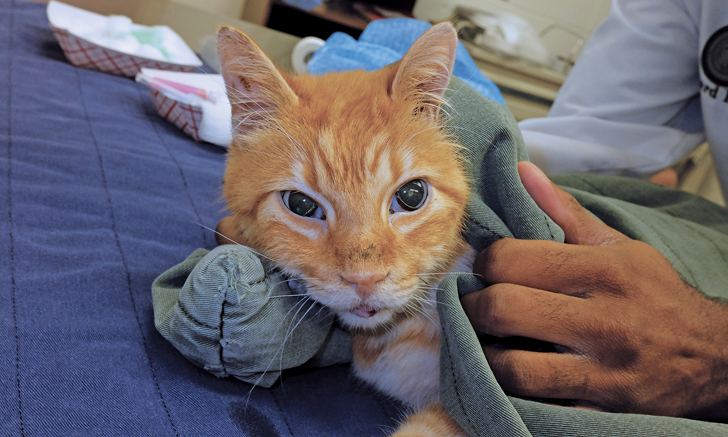 Although use of a smaller mouth gag may seem safer than a spring-loaded mouth gag, some cats may still experience compromised blood flow to the maxillary artery with submaximal opening of the mouth. These blood flow changes occur quickly, and there are no predictive factors as to which cats will be affected. The safest option is to avoid the use of mouth gags altogether in cats. 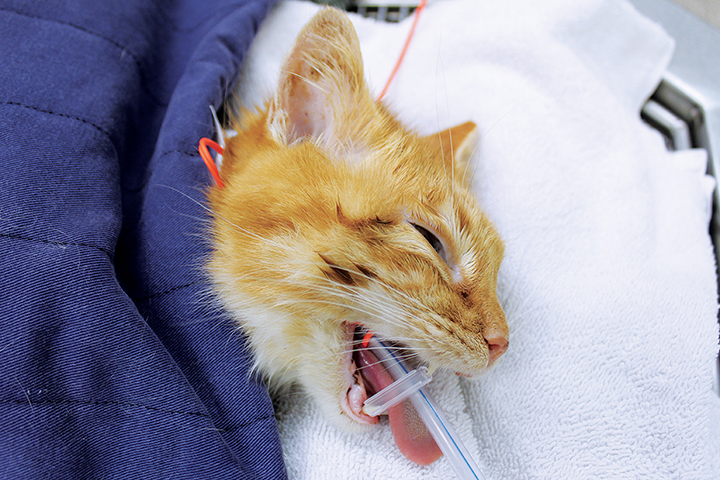 If a mouth gag must be used in a feline patient, the smallest possible gag, ideally less than 30 mm, should be chosen and the duration of use minimized. Read a letter to the editor and the authors' response here. Jurk IR, Thibodeau MS, Whitney K, Gilger BC, Davidson MG. Acute vision loss after general anesthesia in a cat. Vet Ophthalmol. 2001;4(2):155-158. Stiles J, Weil A, Packer R, Lantz GC. Postanesthetic cortical blindness in cats: 20 cases. Vet J. 2012;193(2):367-373. Martin-Flores M, Scrivani P, Loew E, Gleed CA, Ludders JW. Maximal and submaximal mouth opening with mouth gags in cats: implications for maxillary artery blood flow. Vet J. 2014;200(1):60-64. Scrivani PV, Martin-Flores M, van Hatten R, Bezuidenhout AJ. Structural and functional changes relevant to maxillary arterial flow observed during computed tomography and nonselective digital subtraction angiography in cats with the mouth closed and opened. Vet Radiol Ultrasound. 2014;55(3):263-271. Barton-Lamb A, Martin-Flores M, Scrivani P, et al. Evaluation of maxillary arterial blood flow in anesthetized cats with the mouth closed and open. Vet J. 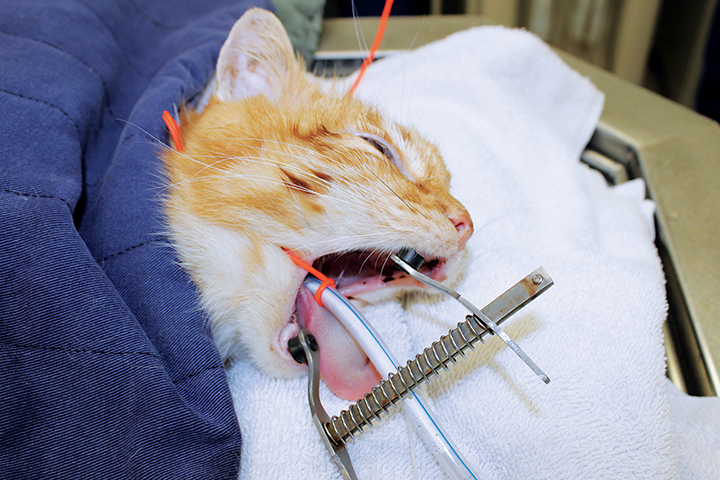 2013;196(3):325-331.
de Miguel Garcia C, Whiting M, Alibhai H. Cerebral hypoxia in a cat following pharyngoscopy involving use of a mouth gag. Vet Anaesth Analg. 2013;40(1):106-108. Reiter AM. Open wide: blindness in cats after the use of mouth gags. Vet J. 2014;201(1):5-6. Strain G. Congenital deafness and its recognition. Vet Clin North Am Small Anim Pract. 1999;29(4):895-907. Muttaquin Z, Oki S, Arita K, et al. Changes of brainstem auditory evoked responses (BAERs) in a brain stem ischemic model using embolization techniques in cats, a preliminary study. Hiroshima J Med Sci. 1990;39(4):103-107.